Details on how to win an ebook copy of this book at the end of the review and a link to purchase it. 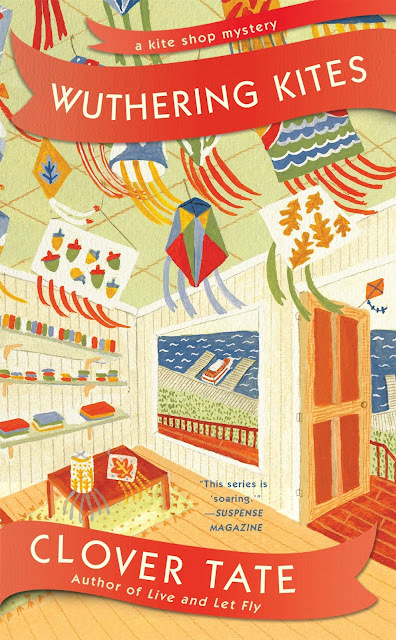 Every cloud seems to have a silver lining for Strings Attached kite store owner Emmy Adler. Her boyfriend Jack Sullivan’s uncle has just died, but his funeral means that Emmy has the chance to meet some of Jack’s family for the first time. The new home Emmy just bought may have sprung an unidentifiable leak somewhere in the roof, but the Victorian house also allows her to live just above her store and kite workshop. Unfortunately, the silver lining of a reporter from Sunrise magazine coming to Rock Port to interview Emmy for a profile precedes the cloud of the discovery of the woman’s body, inexplicably murdered inside the locked kite store. Without the magazine profile to look forward to, Emmy has the chance to focus on meeting Jack’s aunt, twin sister, and cousin. The death of Gus Butler has left the state of his farm in flux, especially with a much younger wife involved and a neighbor interested in buying land for a winery. An alarming discovery, not to mention Jack’s kite charm being found next to the dead woman’s body, places him so high on the suspect list that even Emmy has a few seconds of doubt. Although the moment quickly passes, it means that when contemplating Halloween-themed kites Emmy must initiate her own investigation if she hopes to prove Jack’s innocence. The tourist-centric Oregon town vividly comes alive in this third novel of the series, which has Emmy taking a break from designing her artistic as she instead becomes enmeshed in Jack and his family member’s lives. Perhaps investigating the alibis of her boyfriend’s closest relatives isn’t the best step to take in a new relationship, but Emmy knows that with inheritances involved blood is not always thicker than water. Keeping Rock Point lively is the contentious relationship between Emmy’s handyman and her friend Stella, unfriendly neighbors whose support of rival local politicians escalates into pettiness fought by loud music and possible vandalism. Emmy’s own family adds their own share of delightful moments, especially since their hippie background has her parents performing Watergate reenactments while her sister makes murder spreadsheets. An exciting conclusion off of Oregon’s coast delivers a satisfying and unexpected ending, while building promising future relationships for these charming Rock Point residents. To enter to win an ebook copy of Wuthering Kites, simply email KRL at krlcontests@gmail[dot]com by replacing the [dot] with a period, and with the subject line "wuthering,” or comment on this article. A winner will be chosen October 20, 2018. U.S. residents only.If entering via comment please include your email address. You can read our privacy statement here if you like. Check out other mystery articles, reviews, book giveaways & mystery short stories in our mystery section in Kings River Life and in our mystery category here on KRL News & Reviews. And join our mystery Facebook group to keep up with everything mystery we post, and have a chance at some extra giveaways. And check out our new mystery podcast featuring mystery short stories and first chapters read by actors! Thanks for the review. Book sounds really good. I love the cover. Love puny titles & this sounds like a unique cozy. Thank you for the wonderful review for my pen name's story! It was a really fun book to write, and I hope it will be to read, too. New series to me. Sounds like a great read.